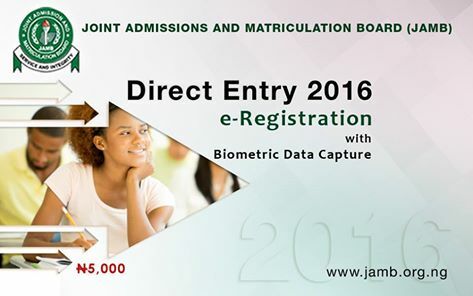 The Joint Admission and Matriculation Board (JAMB) has officially announced the commencement of 2016 JAMB Direct Entry Registration. JAMB Direct Entry is mainly for those that already possess a diploma certificate and wishes to go for a degree programme in the university. Normally, those who gained admission into the university via direct entry will start from part 2 or 200 level in their university of choice provided they were offered admission. Cambridge A Level, B Sc, HND, ICAN, ND, NCE, OND and IJMB. All the holders of the diploma certificates listed above would be admitted provided they pass the direct entry examination and possesses the institution requirements. Read all the registration instructions and details at the JAMB de portal before filling the online form. You may also decide to download the Direct Entry Registration Template and fill before filling the form online. Only submit recent passports of yours that is not older than 3 months and it must not exceed 15 Kilo Bytes (KB) in JPEG format. Bonus tip: Make sure you know the minimum requirements of your University of choice. As of last year, so many DE candidates wasted their money as they do not possess the minimum requirement of the institution they applied for. For enqiry and help, use the contact information below. You can get your 2015 JAMB Direct Entry scratch card from all Designated Banks and JAMB Offices Nation Wide. You can also get the registration done at the JAMB D.E. official portal at http://www.jamb.org.ng/DirectEntry/. The Sign In module enables you to validate your PIN and allows you to supply your basic personal details including biometrics and Passport Photograph. Note that your Biometrics, Passport Photograph and other Registration details can be captured online or offline. These details shall be verified on first visit (Sign-In) and shall not be required subsequently. Note that you are liable for misplacement of your card as your details can be accessed by someone else if found. YOU ARE ADVISED TO KEEP YOUR SCRATCH CARD. On successful Sign-In, you shall be redirected to the registration page, if you have not registered. If your complete registration details including your Examination Town were captured offline, these shall be loaded for re-verification. The only Test option available is (Computer Based Test) which can be selected during offline registration and also available online. If you have otherwise submitted your form, you shall be redirected to the home page so that you can have access to other facilities on your profile. Note also that Multiple Registration is not allowed and may be punished. Registration closing date is yet to be announced. Note: If you did not submit your form before the close of registration, your entry is forfeited.